Ulterior Gallery is pleased to announce the second of two consecutive exhibitions by New York-based, trans-disciplinary artist Robert Buck, who in 2008 changed his surname from Beck to Buck as a work of art. Second Hand will be open April 21 through May 27, 2018, with a reception for the artist Saturday, April 21, 6–8 pm. In 2008, Robert Beck reconceived his artistic self, and challenged our notions of patriarchy, authorship, and identity. By altering his surname by one letter he marked a shift in his artistic practice and broadened its implications. The change was as subtle as e to u, but as powerful as “me to you.” It was his way to re-signify himself, and bypass the system structured by the Name-of-the-Father (the paternal figure of the law, so termed by Lacan, that upholds patriarchal institutions, such as family, church, nation, and markets). The status of the Name-of-the-Father changed irrevocably in the 20th century, and Buck, with his simple exchange of vowels, calls attention to this evolution and its repercussions in his art making—as well as his presence. With this maneuver, topologically like a Möbius band, Beck traversed an exclusively artistic dimension and became Buck. 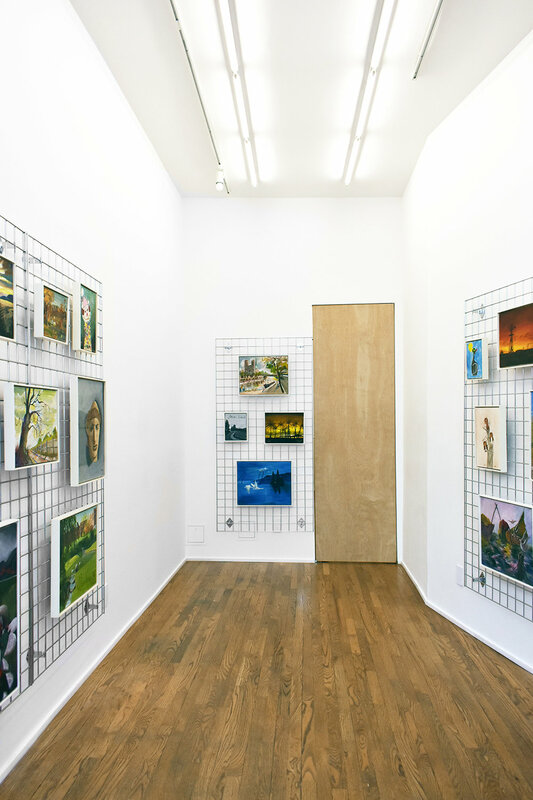 Robert Buck’s Second Hand exhibition debuts his ongoing series of modified thrift store paintings, which he began ten years ago in concert with his self-nomination. In the series, he appropriates guest-book signatures from his exhibitions as Buck and transcribes them using a one-inch ink grid onto found paintings—second hand, as it were. He then signs them “R. 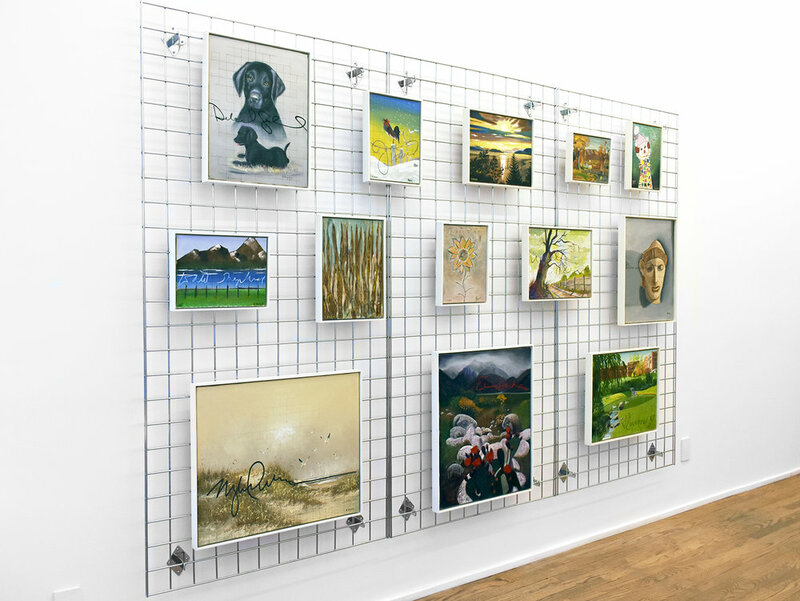 Buck.” The amended paintings are installed on 3-inch-grid metal display panels. 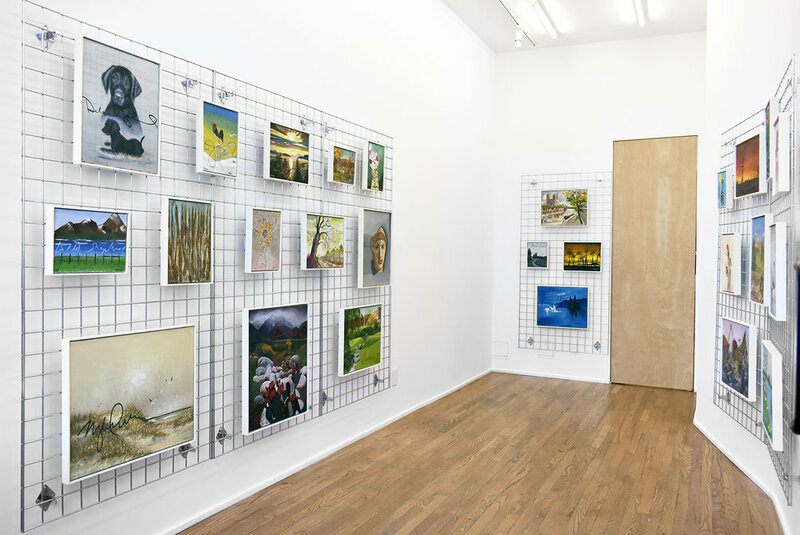 The lattices on the paintings are amplified against the retail trellises, and together engage larger social frameworks, e.g., commerce, ownership, and identities. 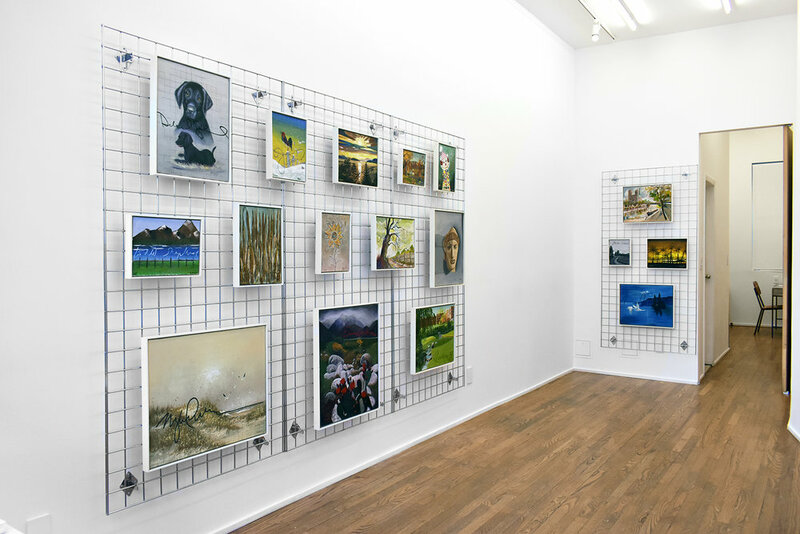 With his artistic reclamations, Buck elevates a fragment of a life rendered by a homemade painting, and of another one implied by a name in a gallery guest-book. By coupling a canvas with an appropriated signature, and “notarizing” it with his new name, Buck highlights the role of all three “participants,” and queries the act of naming itself. While Beck’s earlier exhibition Vestige insinuated the body as a remainder, it is the mind that is solicited by Second Hand, with its conceptual matrices, comprised of the discarded paintings Buck recuperates in the spirit of e to u.
Robert Beck was born in 1959 in Baltimore, MD. He lives and works in New York City and far West Texas. Beck graduated with a BFA from New York University, Tisch School of the Arts Film and TV Department in 1983, and the Independent Study Program of the Whitney Museum of American Art a decade later. He has been exhibiting nationally and internationally since the 1990s. Beck/Buck’s work is included in the collections of the Museum of Modern Art, New York, NY; Whitney Museum of American Art, New York, NY; San Francisco Museum of Art, San Francisco, CA; Dallas Museum of Art, Dallas, TX; Getty Museum of Art, Los Angeles, CA; Columbus Museum of Art, Columbus, OH; and Centre Pompidou, Paris, France; among others. Recent solo and group exhibitions include Strange Attractor, Ballroom Marfa, Marfa, TX (2017); Robert Buck: States of America, Pizzuti Collection, Columbus, OH (solo, 2016); and, in collaboration with Donald Moffett, Range: Experiments in New York, 1961–2007, Metropolitan Museum of Art, New York, NY (2017).